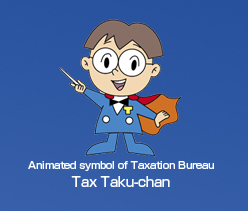 Thank you for visiting the Tokyo Metropolitan Government Bureau of Taxation's English language website. General information on metropolitan taxes is provided on this website for foreign nationals residing in Tokyo. In addition to providing information on the TOPICS page, this website also offers helpful pages which allow the user to search for information by a specific type of tax or special situation. * Taxes in Japan can be classified into national taxes and local taxes. This page mainly explains the metropolitan tax portion of local taxes. (To determine whether a specific type of tax is a metropolitan tax, please click here.) For questions related to national taxes or municipality taxes, please click here for contact information.